The Magento 2 platform was represented as something much more robust and user-friendly than Magento 1. It is an entirely new ecommerce solution rather than the updated version of the old platform. Indeed, Magento 2 solved lots of problems that irritate merchants in Magento 1, but it is still far from being perfect. For instance, the layered navigation functionality was added to the platform. In case of Magento 1 it was possible only via third-party extensions. However, what did we get in Magento 2? Layered navigation that still has a room for improvement. The Magento 2 layered navigation multi-select functionality for one filter is still possible only with such tools as Amasty Improved Layered Navigation. As for other enhancements this Magento 2 layered navigation extension provides, they are described in the following post. Also, don’t forget to check our comparison of the best layered navigation extensions for Magento 2. Let’s start our journey (today it will be very long) into the world of the Magento 2 layered navigation extension by Amasty from its core features. Although this one doesn’t look like a massive list of features, the further more detailed exploration will help you find out all nuances. The Magento 2 layered navigation extension is really comprehensive and powerful, and we undoubtedly agree with Amasty that it is the most feature-rich tool in the whole Magento ecosystem. If you know a tool that offers broader functionality, please, let us know via the comment section below. It is also necessary to mention that the Amasty team often pushes updates making the module even more valuable. Therefore, lots of pleasant surprises are waiting for us in future. However, let’s return to the already available features. The Magento 2 layered navigation extension is based on AJAX. If you are not familiar with the technology, we should ensure you that AJAX makes every module much more user-friendly. It entirely eliminates reloads. What does it mean for a layered navigation Magento 2 extension? You customers reach the desired products much faster in a better mood: no reloads occur every time a new filter is applied! Thus, the first strong advantage of the Amasty’s layered navigation module is obvious. As for a flexible menu, it offers several parameters that allow you to configure the frontend appearance of the Amasty Improved Layered Navigation Magento 2 extension according to your ecommerce needs. First of all, there are two types of menu layout. In addition to a more common vertical menu, Amasty adds horizontal one. Thus, depending on your store design, you can choose one that is the most suitable. Besides, it is possible to enhance filters with sliders, radio buttons, drop-downs, and checkboxes. The Amasty Improved Layered Navigation Magento 2 module allows creating a stunning shopping experience where every element has a unique appearance and engages customers to interact with it. Another significant improvement the Amasty Magento 2 layered navigation extension adds to the default navigation system of the platform is a page that contains all products and all filters. It may look like something extremely chaotic, especially if there are several categories on your store, but often such page helps customers to find the desired items much faster: they apply the necessary filters and get a small but very precise selection of the most likely products. You must admit that it is better to provide customers with this page (if it is not mandatory) than to eliminate an alternative way of finding something. Besides, multiple filters and their options can be applied in bulk, fundamentally improving the default navigation. In this way, the Amasty Improved Layered Navigation Magento 2 extension does an excellent job making shopping experience flawless and superbly fast. Now, let’s discuss navigation filters this Magento 2 layered navigation extension provides in more detail. When it comes to this aspect of layered navigation, Amasty does miracles. First of all, you get a great variety of display modes. To be specific, the Amasty Improved Layered Navigation Magento 2 module provides five basic filter display modes: labels, images, a combination of the first two types, drop-down, and text swatches. Depending on the filter type, the most convenient mode is applied turning boring shopping into an engaging experience. Furthermore, Amasty’s Magento 2 layered navigation extension allows using dependent filters. It means that a section with filters will be always neat and carefully ordered since there is no need to display all filters. New options appear only when a customer selects a particular filter parameter providing the ability to make more precise picking. For instance, in Brands, choose Umbro, and the color selection will be limited to one option. As we’ve already mentioned, the module allows selecting multiple values of the same filter. This dramatic improvement allows to forget all your doubts concerning the necessity to install a third-party layered navigation Magento 2 extension, isn’t it? 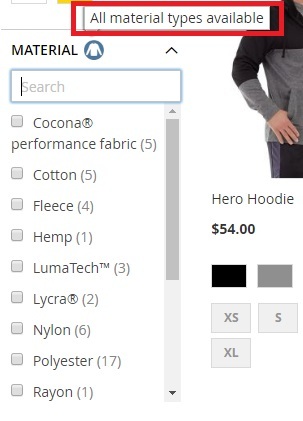 Imagine how happy your customers will be when a color filter will allow them to select several parameters eliminating the need to look for a gray hoodie and then repeat everything for black one. To make the filter section even more organized, the Amasty Improved Layered Navigation Magento 2 extension provides the ability to set a limit on displayed filter options. For instance, you can show only four most popular parameters for each filter. If a customer needs more, there is the More button that unfolds other filter items. Alternatively, it is possible to use vertical scrolling. 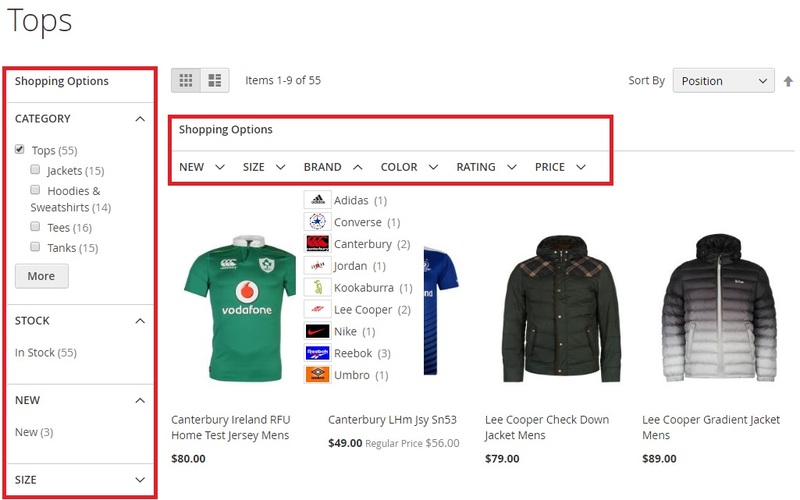 Another customer-oriented feature of the Magento 2 layered navigation extension by Amasty is a search box. 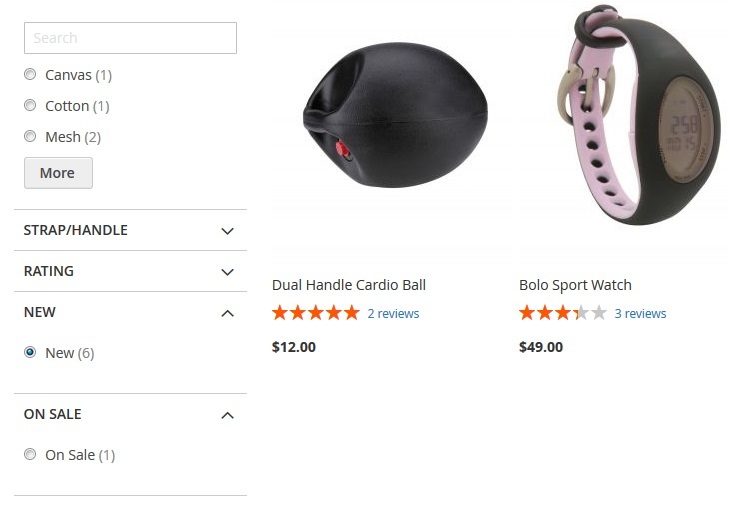 Yes, you can add a search box right to product filters. As a result, a customer can easily find the necessary parameters in a long list of filter options. Furthermore, it is possible to add tooltips with additional product-related information. As a result, shopping experience will be dramatically enhanced once again. Also, don’t forget about image swatches that help customers find what they are looking for. Now, let’s say a few words about the Shop by Brand functionality. Due to this feature, the Amasty Improved Layered Navigation Magento 2 module allows customers to find brands they are looking for. 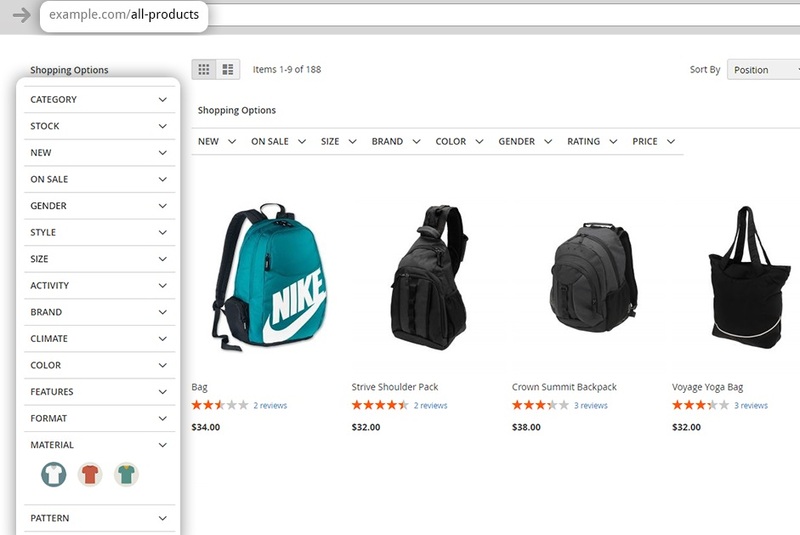 The Magento 2 layered navigation extension provides the ability to create unique brand pages with custom content, add brand filters with corresponding logos, and fully leverage brand sliders. First of all, you can create a page with all brands you work with. Since everything is arranged in alphabetical order plus each brand gets a logo, it is extremely easy to find the desired companies. Furthermore, it is possible to add the Premium Brand slider to simplify search even more. Note that the slider can become a part of any category page not to speak of a page with all brands. Next, the Magento 2 layered navigation extension allows creating a unique brand page with its own content. Add images, descriptions, and banners to make the page more appealing to customers and search engines. The products of one brand now can be gathered in a single place. Also, note that a brand logo can be added to a product page with the Magento 2 layered navigation module. As for some advanced filters, the Amasty Improved Layered Navigation Magento 2 extension allows adding such new options as On Sale, Rating, New, and Stock. As a result, the selection of products becomes as much precise as possible. Pay attention to the Rating filter and its design: it not only attracts store visitors but also helps to filter out the most popular products of your ecommerce store within a few clicks. It is also necessary to tell about the visual appearance of various numeric attributes. The Amasty Improved Layered Navigation Magento 2 module allows showing sliders, ranges, and from-to widgets for them. This option makes filtering easier and more intuitive. Most of the mentioned above features can be applied to a category filter with this Magento 2 layered navigation extension by Amasty. First of all, it fully supports multi-select functionality, so any number of categories and subcategories can be chosen. Next, you can set a limit on the amount of unfolded options. There are also two display modes: Labels and Dropdown. The first one allows selecting between two display types: Fly-out or Folding. Now, let’s describe SEO improvements provided with Amasty’s layered navigation Magento 2 extension. First of all, the module allows creating short URL and adding custom meta data for brand pages. Besides, you can add unique descriptions and images to make them even more search engine friendly. Custom meta data and unique texts can be added to pages with filter results, increasing SEO-friendliness of your Magento 2 website. Besides, the Amasty’s layered navigation module generates sane URLs for these pages. At the same time, it is possible to provide pages with filter results with any URL keys regardless of category or subcategory names. Now, when you know everything about the frontend appearance of the Amasty Improved Layered Navigation Magento 2 module, we’d like to draw your attention to its backend functionality. Get ready for the most extended Magento 2 backend tutorial in your life. Under Stores -> Settings -> Configuration -> Amasty Extensions, you can find five tabs dedicated to the Improved Layered Navigation Magento 2 extension: Improved Layered Navigation; Improved Layered Navigation: All Products; Improved Layered Navigation: Brands; Improved Layered Navigation: Pages; Improved Layered Navigation: SEO. In its turn, the first section is divided into ten sections: General, Category Title and Description, Children Categories Block, Category Meta Tags, Category Filter, Stock Filter, Rating Filter, New Filter, On Sale Filter, and Tooltips. Such a huge list of settings, isn’t it? Although it may scare off some merchants and even marketers, we recommend you to ease anxiety: the more powerful and feature-rich the tool is, the more complicated settings it has. We only have to accept the nature of complex extensions and spend a little bit more time on their exploration. So what about the settings of the Magento 2 layered navigation extension? The first one allows you to enable and configure AJAX and some other parameters of the Magento 2 layered navigation extension. Set “Enable AJAX” to “Yes” and decide whether to scroll to top after AJAX load or not. Next, you can activate vertical scrolling for filters that are higher than the specified value. It is also possible to choose whether to submit filters instantly or by click on desktop and mobile. Besides, you can hide single-choice filters after a parameter is selected. The Category Title and Description section of the Magento 2 layered navigation extension states that you can define Title, Description, Image and CMS block for your filter options under Stores -> Attributes -> Product -> [open attribute] -> Properties -> [open attribute option settings]. In “Add the title & description of the selected filters”, you can specify any filters to which custom title and description should be applied. Select where to display a filter title (Before, After, or Replace Category Name, Do Not Add), type a character to separate category name & title, select a place to add a filter description, decide whether to replace a category image and a CMS block. In the Children Categories Block, you can enable/disable the display of subcategories, specify the size of the thumbnail image, enable/disable image labels and slider (is ‘No’ is selected, subcategories will be shown in a static block), and decide how many items to display in the slide. In the Category Meta Tags section, you can select filters to apply additional metadata changes. Select a position of a filter title towards the meta title, specify a title tag separator, specify a filter description towards meta description, specify a description tag separator, and select a position of filter title towards meta keywords. The Category Filter section of the Magento 2 layered navigation module contains a button that redirects you to the settings on the attribute information page. Under the Improved Layered Navigation tab, the Amasty’s Magento 2 layered navigation extension allows you to: select a display mode (above, we’ve already mentioned this option: choose between labels and drop-down); select block where to display the filter (Sidebar, Top, Both); specify the depth of a category tree; select a subcategories view (Folding or Fly-out); decide when to expand subcategories (always or by click); configure more than a dozen other parameters including rel=”nofollow” and other SEO features. Now, we’d like to return to the Stock Filter configuration of the Magento 2 layered navigation extension. In the appropriate section, you can enable the filter, select where to display it (sidebar, top, or both), specify its position, label, and tooltip. Next, you can enable/disable the expand functionality and choose a display mode (Labels or Dropdown). As for the Tooltips section, it allows to enable/disable the feature, as well as upload a tooltip image. Now, we can proceed to the All Products tab. Here, the Amasty Improved Layered Navigation Magento 2 extension allows turning on the feature and specify the page URL to make it SEO-friendly. The Brands tab of the Magento 2 layered navigation extension contains more options which are divided into three sections: General, All Brands Page, and Brad Slider. 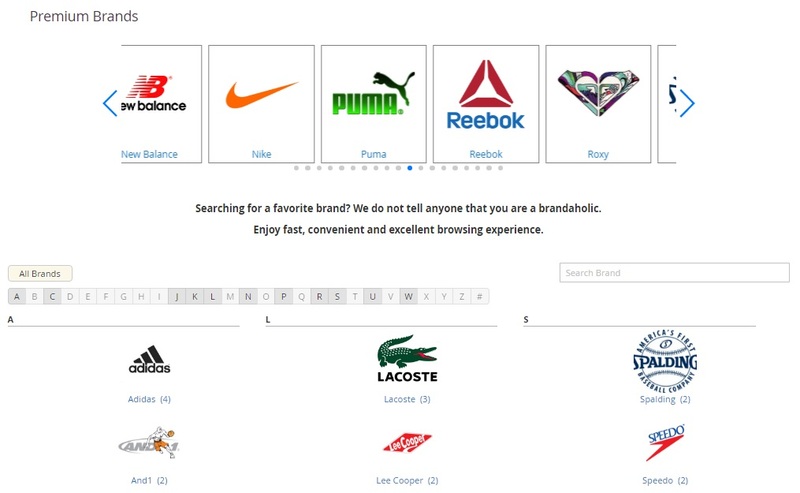 The first one provides the ability to select a brand attribute to filter products by a particular brand and deliver unique content assigned for the option of the brand attribute. Next, you can specify a URL key, choose CMS pages, select a behavior for brands links in a menu bar, add brands to account top links, and create brands item label. 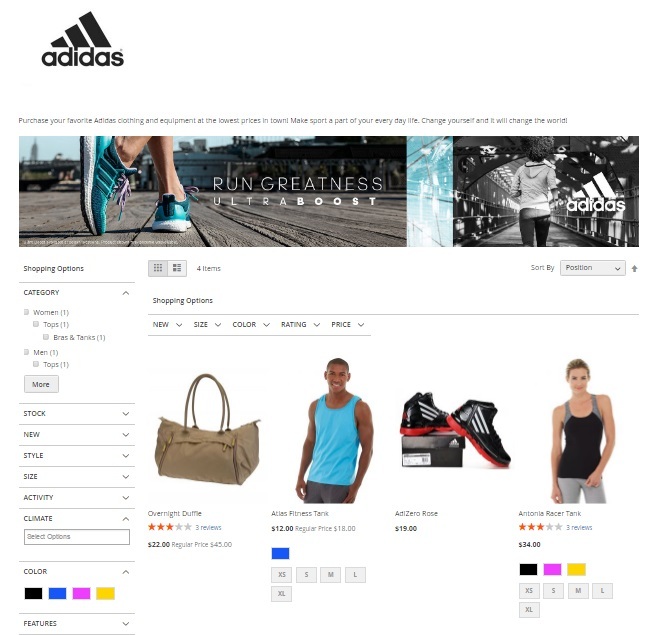 As for the Brand slider, Amasty layered navigation module for Magento 2 allows specifying visible items qty, apply sorting by name or position, set color for header background and header text, create a custom header title, and set a limit on slider and image width. Besides, it is possible to enable the display of brand labels and buttons, infinite loop, touch simulation, pagination and clickable pagination, and autoplay (autoplay delay can be configured) with this Magento 2 layered navigation extension. In the Pages tab, you can enable/disable strict pages matching. The SEO tab of settings is divided into four sections: SEO URLs, Robots Tag Control, Canonical URL, and Previous/Next. In SEO URLs, you can enable SEO-friendly URLs, add a suffix to various pages, select option separator, and allow redirection to SEO URL for category pages with applied filters. In Robots Tag Control, enable/disable the Magento 2 layered navigation extension to modify Robots Meta Tag. To make layered navigation compatible with other SEO tools, turn off the feature. Besides, you can enable rel=”nofollow” to be added to filter links when required. In Canonical URL, specify this feature for category and All-Product pages. In the Previous/Next tab, you can enable Prev/Next tags on improved navigation pages to help web crawlers to index paginated content. Pages related to the Amasty Improved Layered Navigation Magento 2 extension are available under Content -> Elements -> Pages. There is a grid with pages showing: page ID; title; URL key; layout; store view; status; time of creation/modification; custom design (from/to), theme, and layout; meta title, keywords, and description. You can edit/delete or view each page individually, as well as delete, disable, enable, and edit pages in bulk. Let’s see how to edit the Shop by Brand page. You can enable/disable the page, as well as change its name. The Content section of the Magento 2 layered navigation extension allows you to use the editor to create a well-looking page with unique content. In Search Engine Optimisation, the Amasty Improved Layered Navigation Magento 2 module provides the ability to specify a new page URL (to make it SEO-friendly), as well as add meta title, keywords, and description. The Page in Websites section enables you to select websites and store views where to display Shop by Brand page. In Design, you can enable/disable the Improved Layered Navigation functionality, select a page layout (1, 2 (left or right bar), 3 columns, or empty), and update layout via the Layout Update XML field. In Custom Design Update, specify a schedule for a new design and select new theme and layout that will be used by the Magento 2 layered navigation extension. Congratulations! 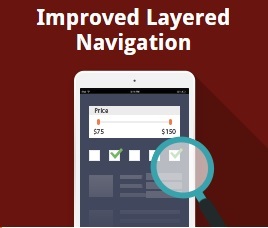 Now, you know how to configure the Amasty Improved Layered Navigation Magento 2 extension. Of course, its backend interface configuration is much more extensive than we’ve just described, though above you can see how all key parameters can be configured and customized. New information section to the Configuration page is added: see the current extension’s version; available updates, link to the User Guide; other useful data. ‘Images & Labels’ display mode becomes available for the attributes with multiple select. New option for the ‘Render All Categories Tree’ for saving time: render the current category path and the siblings of the active path, but not the children of those siblings. Multi-select can be used in the Brand filter. ‘Show’ button indicating the number of products with the selected attributes is shown next to the attribute selection before applying the filter. You can decide how to apply filters – with the button or instantly – separately for mobile and desktop view. Update of the All Brands page design. Each option in the multi-select filter can be removed separately. Various tooltips can be uploaded and used in the filters. The module is compatible with the Amasty Shop by Brand. Now it’s possible to edit the name of the ‘Brands’ icon in the menu. Compatibility with Magento Elastic Search was introduced. A new option was introduced: you can display subcategory images in the category filter. Now you can display subcategory images in the horizontal bar with the slider available. A new feature was added: now it’s possible to display particular options at the top of the filter. Other options will be folded. Now you can add “Previous” and “Next” pagination meta links to point search engines where the next or the previous pages are. The order of SEO aliases in the URL is set according to the filters’ order now. Attributes mapping was added. It allows grouping filter values for more compact and precise navigation. Now you can display optional images on the product page for any filter option. 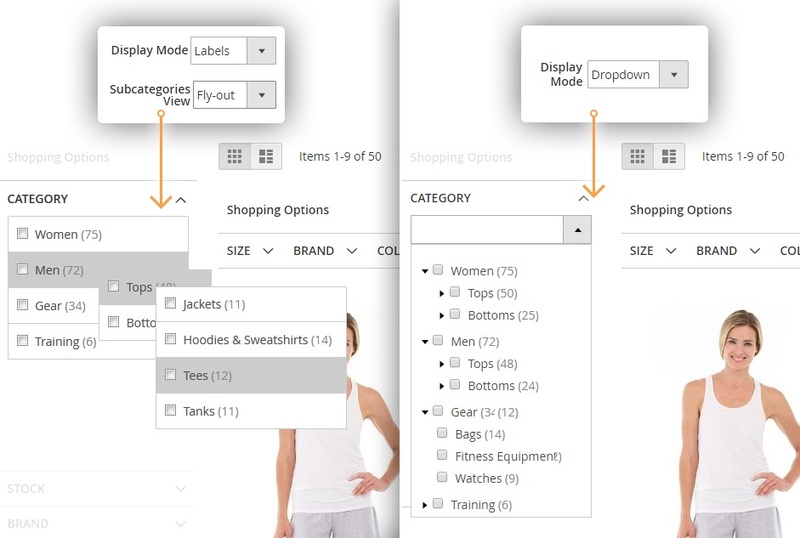 Expand current subcategories in the category filter in the tree mode. Ability to configure an ‘All Brands’ link position in the top menu was added. Top filters were added to the search page. Now you can put the brand name at the beginning of the SEO URL. Now the module allows limiting the price slider range for UI experience improvement. An ability to add rel=”nofollow” attribute to the filter links was added to reduce search bots burden. The brand filter was removed from the brand page for SEO improvement. The ability to add URL suffix to a brand and filtered ‘all-products’ pages was added. The ability to add a category image to the Custom Pages was added. The ability to add the custom Title, Description, Image & Meta Tags for the Category Pages when filters are applied was made. An option to enable the vertical scrolling to filter blocks higher than the size specified in the settings was added. SEO configuration tab is available now for the website and store scopes. The ability to hide or keep visible a single-choice filter after the selection was added. Possibility to show the radio buttons for the single-choice filters. The ability to choose URL Alias separator: ‘-‘ or ‘_’ was added. ‘On Sale’ filter was added. An advanced category tree with multi-select and various display options was implemented. ‘Apply by Button’ feature works on the Search page now. ‘On Sale’ filter works for configurable products now. The SEO settings (Index, Follow) for the category filter were implemented. ‘AJAX: scroll to top’ was added. “New” and “On sale” filters were added. “Apply by Button” feature was updated; drop-down multi-select filters display mode; H1 tag update via AJAX. Ability to add Brands Slider to All Brands page, any CMS Page or static block by inserting the embedded code or adding a widget was added. Ability to add Layered Navigation to Home or any CMS Page was added. Breadcrumbs for “all-products” and Brand pages were added. Flexible canonical URL modes for the category pages and “all-product” page were added. SEO URL feature supports store codes as well as the installation into a sub-directory now. Compatibility with Amasty AJAX/Infinite Scroll was added. Templates modification for PHP syntax was added. Brand images were added to the list widget. Now you can upload brand logos and display them on the brand list widget to make it more appealing to the visitors. The extension received some minor updates and improvements, such as automatic hiding of the slider or the from-to widget when the min and max values are the same.